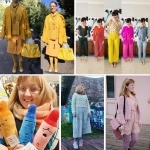 Well, my slow fashion coat-making fun has stalled because Republique du Chiffon are getting into the spirit with suitably slow shipping and my Bernadette paper pattern hasn’t shown up yet. While I wait to get started, I’ve been bashing out a much-needed couple of pairs of jeans. It would’ve been inconceivable a while ago that making jeans could be a mind-switch-off type of project, but I’ve made so many now and have my TNT patterns all set so it really is quite relaxing. Plus they’re just great for doing a little bit here and there as there are clear processes and break points during the making. These are another pair of Gingers; the high waist View B variation. My first pair of blue Gingers were sort of a wearable toile and not quite right – a few fitting quirks and the denim was not stretchy enough, so they’ve been donated. My lovely black pair however are a wardrobe staple and I knew I wanted a replacement blue pair soonish. 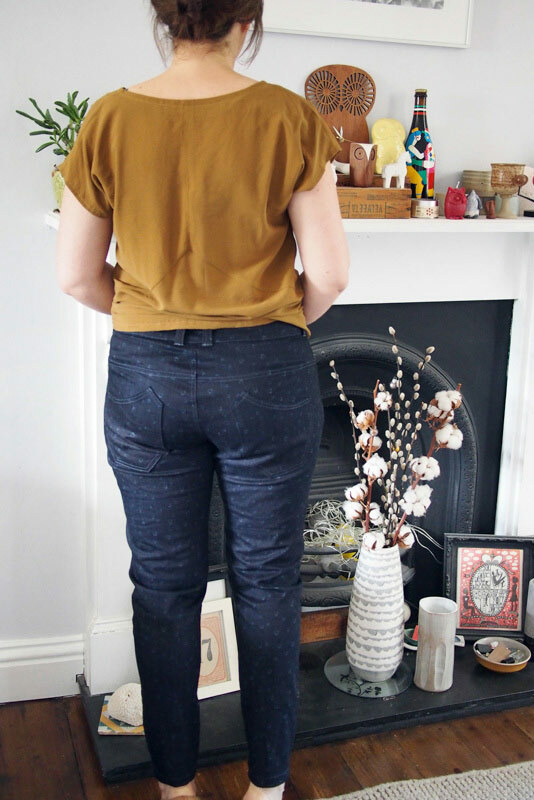 I got this super stretchy solid blue denim from B&J Fabrics in New York which did the trick nicely. 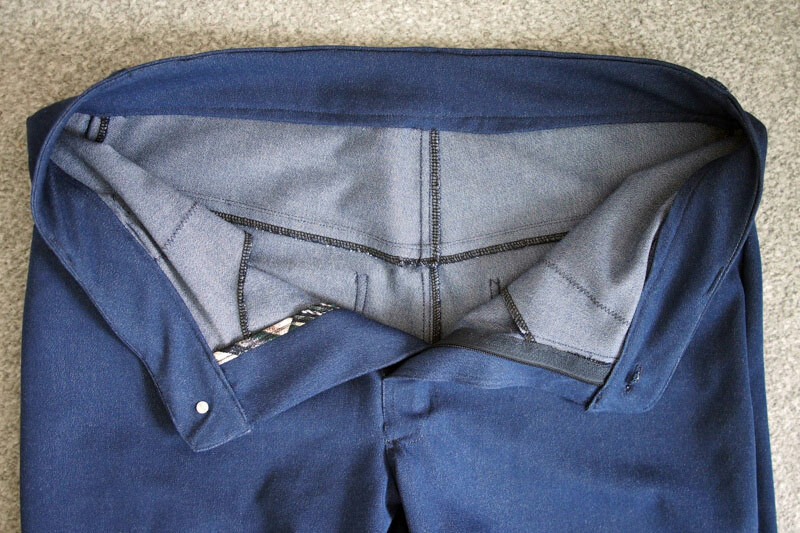 I also made a small fitting tweak, tracing the crotch curve from View A onto View B, which seems to have helpd with the whiskering I got in my first pair. Otherwise a dead simple sew. I made life easier by using regular navy thread to topstitch and just serging the raw seams. The pockets and fly shield binding are made from leftover rayon from the top I’m wearing (a beautiful new-release pattern that I’ll write more about soon! ): ah, that warm sewist feeling when your shirt matches your jeans guts, amirite. This second pair is another repeat pattern, a second pair of Burda 6978s. 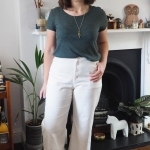 I wear my first pair to death – they have held up really well, haven’t bagged or lost colour and are just so comfortable – so I really wanted a slight variation to get more wardrobe mileage. 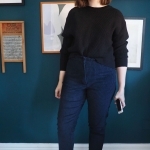 However it turned out that the loose fit looked a bit weird in a stretch denim as opposed to the rigid one of my first pair, so I just kept taking them in until they ended up a bit more skinny than boyfriend fit in the end. I actually love how they look though, so it’s all good. I cut the hems just on the ankle bone as I find this length works better both with all my shoes and I’m constantly cuffing all my other jeans. 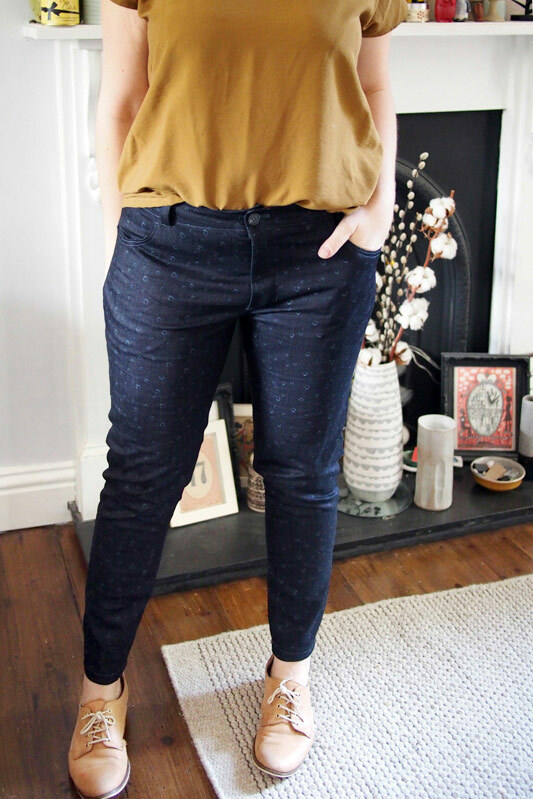 I bought this cotton-spandex denim online from Guthrie Ghani (it’s now sold out) – I was pretty excited when I found it because the subtle ‘feather bubble’ print is exactly the same as a pair of my favourite old RTW Gap jeans which are now completely worn out and too small. It feels nice quality with plenty of stretch recovery, however despite prewashing, it bled indigo all over my hands as I worked with it so I need to chuck the finished jeans into a wash with salt to try and fix the dye. They’re quirky aren’t they, I love the shape – it came with the pattern. 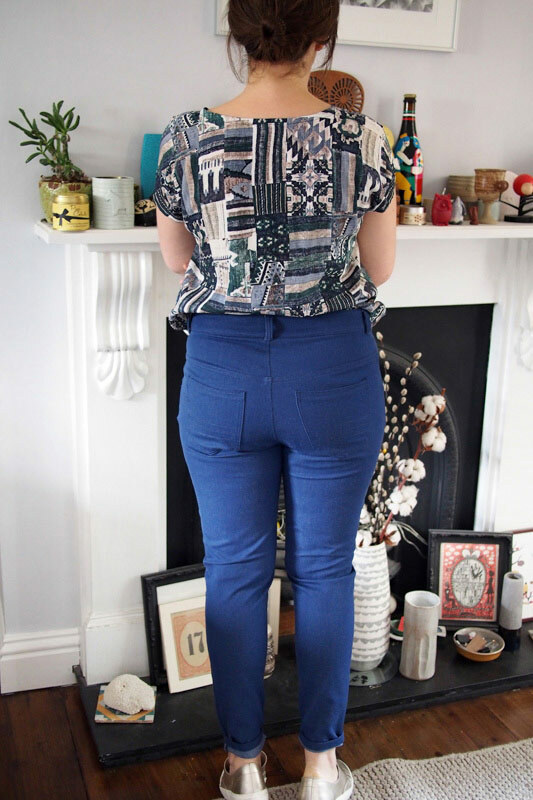 I envy you your TNT-jeans, my pants-sewing always get bumped down the sewing-queue by prettier and easier tops! 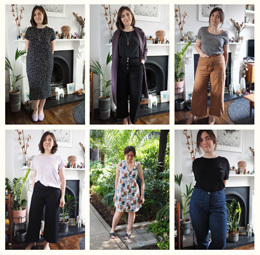 I go through phases to be honest – gone off dresses and back into pants at the mo! Both fabulous! Are the tops from Marilla’s collection? Thanks! I tried a flat-felled seam on my swatches as planned, with the quilting trimmed out, and it actually worked rather well. That printed denim is fantastic! So cool you were able find that. 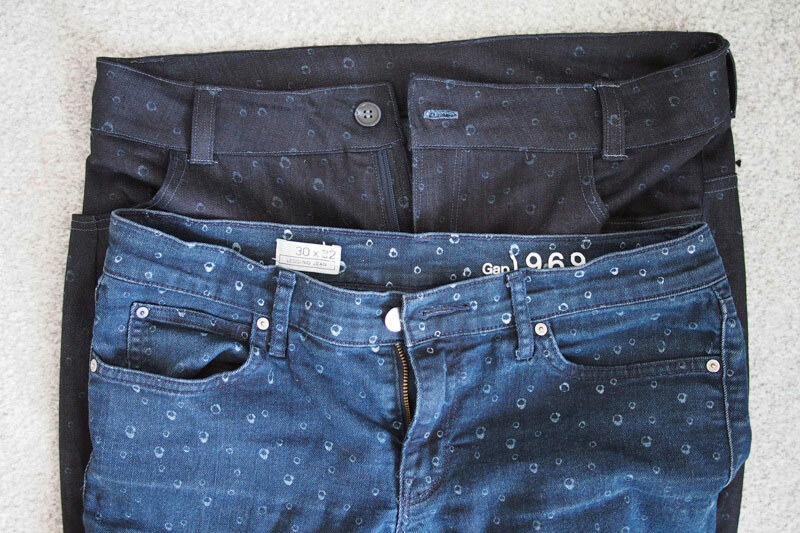 Both jeans look great! In the meantine, chapeau! Great sewing, Katie! These both look great! And your tops are awesome, too! Fitting is a pain, but nice to have it sorted! I love the second pair especially. The back pockets are inspired! Thanks. The pocket shape is fun isn’t it, interesting to sew too! These pants look amazing. You have done it perfectly and the denim is beautiful. Both of these look great! I love the back pockets on the burda ones! 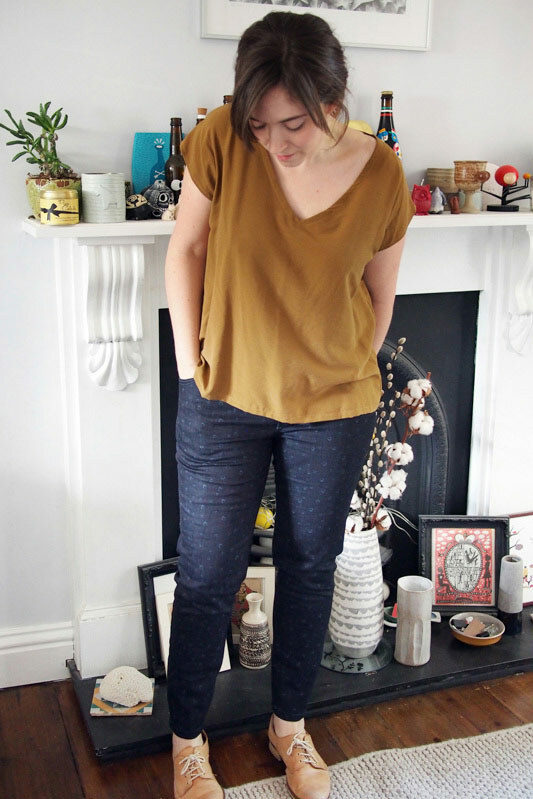 I love that jeans are a soothing sew – I find the same. I like that there are lots of steps and you feel accomplished after each one. 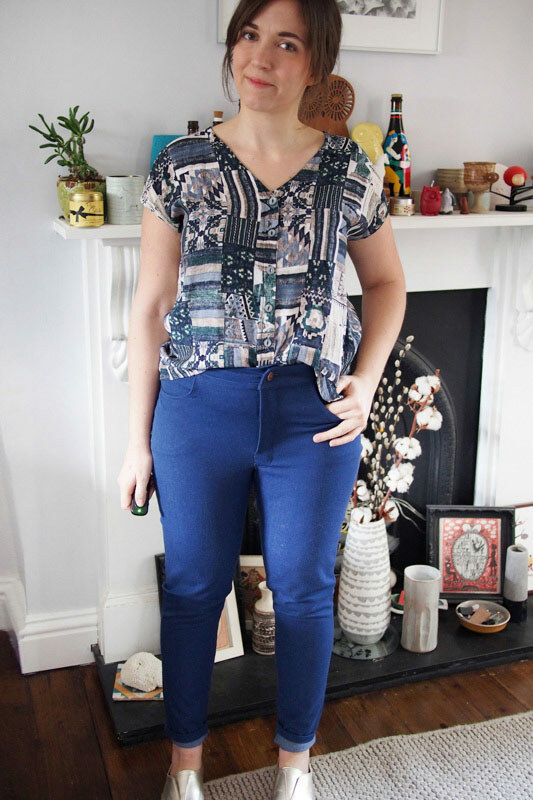 Oh and I love when my top matches my trousers, even if no one knows but me! Cute jeans! You’ve got some nice denim fabrics there! 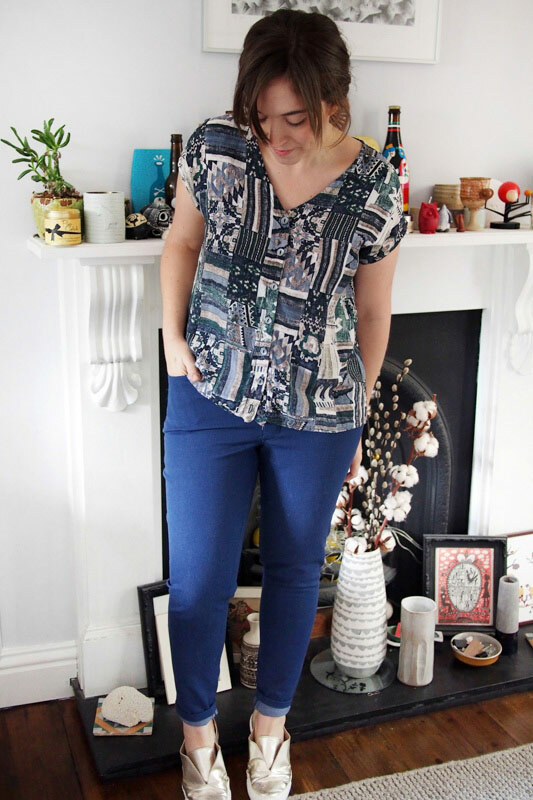 I’m still on the look out for the perfect black denim and one with a print of some sort – maybe flowers, maybe not! That belt loop made me laugh out loud ! !